Yesterday was a most historic day for Democrat’s. It seems the “messiah” has already deemed himself the Winner of the Democratic nomination. It appears that even though the race is not finished, most think it is. Including Obama himself. Time Magazine even got into the idea, and featured him on the cover. Smiling ear to ear, like the cat that just ate the mouse. In a interview with Wolff Blizter of CNN, Obama seemed confident that Hillary’s supporters will follow him. I am not sure that is really the case. 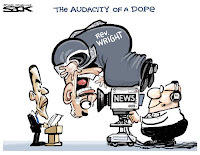 I watched the news media follow Obama around yesterday, as if he were already the president. Why is so many people so blinded by this man? I have to ask myself daily. I can see through the broad smile, and fancy empty suit. Why Can’t everyone else? The truth may be stranger than fiction, they don’t want to. Alot of Americans have supported Obama based on “Hope”. But hope is much like faith, and I am not sure that any ones faith should hang on someone like Obama. At this point I am sure it will do no good to try to convince anyone who supports him, that they are wrong. Obama supporters have turned a blind eye and a deaf ear, to anything negative. My vote, if Obama is the nominee, will go to John McCain. As will lots of others like me. The media has been, until recently very soft on Obama. Not wanting to say anything that may be perceived as racial. Even though, everything anyone says that does not benefit Obama, is seen as racial. The “Obama Messiah” idea is a direct result of our media. They have glorified him like a god. Some stations should have put on cheerleader outfits, and held their pom-poms high.. The media has helped to fuel this “machine”. They have declared Obama the winner,and counted Hillary as “toast”. I find this kind of journalism disgusting. Everyone seems so caught up in the color of his skin, that they do not see the man. So race has affected this race, and the media fueled the fire….. Hopefully its a fire that can be put out…. For all of Americans sake.